Take bright spotty paper, punch with Martha Stewart Doily punch, ink all edges, and affix to white base card with double-sided tape. Stamp frame and sentiment from Gina K. Designs/ Melanie Muenchinger's A Beautiful Life set onto bright pink cardstock. 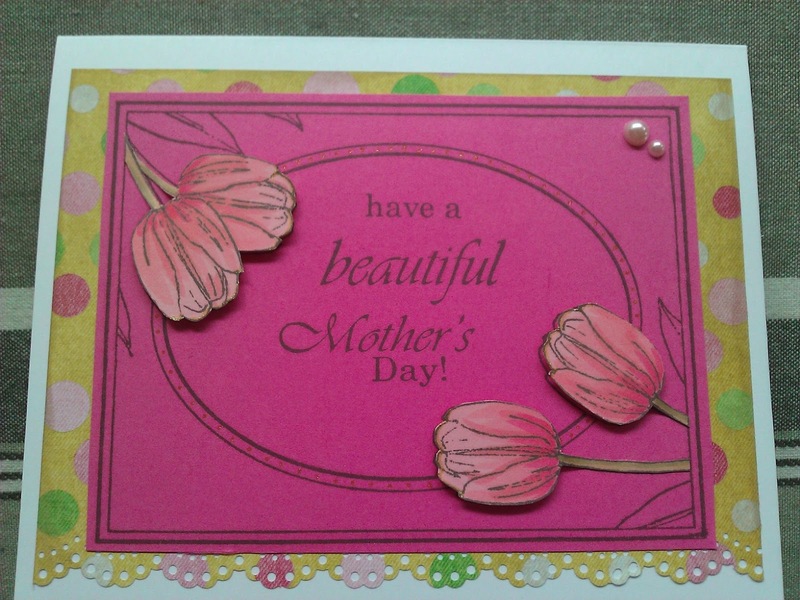 Stamp frame again onto pale pink cardstock, colour tulips with Copic markers, edge with Gold Spica pen, and cut out. Affix the flowers with glue under the stems, and foam tape under the flower heads. Dot Clear Spica pen within the oval border. Mount topper onto base card with double-sided tape, embellish with pearls. Well hello paper rainbow!! welcome to the world of blogging! just found you! yay!